Sometimes a Friday night can get away from you. A good night with friends can be costly to one’s faculties in the early hours of Saturday. So, one can only imagine, what a good timing fellow in Baton Rouge, who doesn’t keep up with the news, must have thought when he stepped out this past Saturday to see “Geaux Gamecocks!” emblazoned across billboards around town. Had there been a coup? What was in that last drink, and how long does it take to ride to South Carolina? And, even worse, had Steve Spurrier finally taken over the world? But, his questions would be irrelevant, for that billboard – created by the hometown newspaper, The Advocate – was just one example of how Louisiana State University opened its arms to their SEC rivals, the South Carolina Gamecocks and their fans, as they dealt with the flooding from Hurricane Joaquin. All joking aside – no one would know more about what the Gamecocks community was experiencing than the Bayou Tigers, who postponed a game with North Texas and played a “home” game at Arizona State after Hurricane Katrina. They took the kids, families and staff of South Carolina under their wing – all too aware of the fear and uncertainty that many of them faced. No, I don’t think anyone actually arose that morning unaware of the events that led to this strange Saturday. The school began preparations days earlier, on Oct. 7, after it became official the game would be relocated to Baton Rouge, and word spread there was a game in town. The school would sell over 40,000 tickets over the next few days, which is an impressive number considering college football fans plan their falls months in advance. LSU would donate the proceeds, minus expenses, from the ticket sales to South Carolina. Which was only one of many gestures between the two Southern institutions. The Gamecocks flew to Baton Rouge on LSU’s charter plane. Now, I hate the price of a single ticket just to get to Cincinnati, so my head spins trying to wrap my mind around what that would cost. And when the good folks from the East got off the plane they were greeted with a barbecue lunch. On game day, South Carolina’s palmetto and crescent mooned state flag flew over Death Valley, and its image played on screens throughout the stadium. 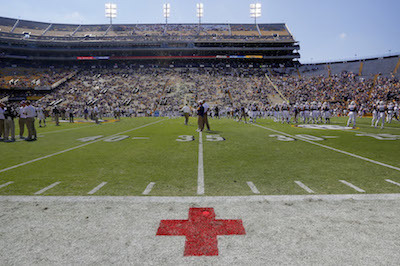 The Red Cross was on hand, handling donations received from the Tiger faithful – where they collected canned foods, and people’s hard-earned money, handed over without a second thought. Sometimes, it’s the small gestures that mean so much. The one gesture I keep going back to – and I think best captured the spirit of the day – was from the LSU Tiger Marching Band. Like the LSU administration and the city at large, the band rolled out the red carpet as well. And, how do the musically gifted do that? By song of course. The band, in a matter of days, would learn the sort of new school fight song for South Carolina “Sandstorm,” and the school alma mater, “We Hail Thee Carolina.” Think about it, the band mastered these new songs in such a short time, it can be counted in hours. Now, I know nothing about playing music. My closest achievement to any type of “performance” is my ability to smash a guitar into pieces. Honestly, give me your old axe and I will Kurt Cobain it into a pile of toothpicks in a minute. So, it blows me away that the LSU marching band would undertake such an endeavor and do it so well. It was a day where everyone pitched in. Fans from both sides, some who would never talk to each other if not for this weekend, they gathered around and shared tales and recalled memories from a now-shared past and present. A group of students painted their chests, not with “Go Tigers!” or a funny play on words, but with “S-E-C U-N-I-T-E-D.”And, during the game, just like many times before and throughout all of the stadiums, especially at national championships, the chant of “SEC! SEC! SEC!” reigned down from the crowd. To these ears, it never sounded better. For, like all families, we have fights, and we give each other hell. But, like real families, when the chips are down, and folks are in need, we are the first ones to answer the call. As is becoming commonplace, Leonard Fournette had an impressive game against the Gamecocks, rushing for 158 yards and one touchdown. The product of New Orleans’ St. Augustine High School is still easily the leading candidate to win the Heisman trophy. But, to me, with all of his on-field accolades, I am becoming more impressed with what this young man has done after the game. A week after calling out his team’s (himself included) poor play, after an easy victory, Fournette had a message to deliver post game. It wasn’t rah-rah talk, or football focused. It was to the players, fans, and community of South Carolina. It was eloquent. It was empathetic. It was literally offering the shirt off of his back. And, in this extraordinary situation, the NCAA has allowed an auctioning off his jersey. The proceeds will also go to aid the victims of Hurricane Joaquin and its subsequent flooding. Look for the details of the auction on @fullsportNOLA. And another big round of applause for the LSU Tigers and South Carolina Gamecocks, as they allowed us not to have to address what happened in Philadelphia on Saturday and, of course, Sunday. Southern University keeps marching on with a 45-34 victory over Alabama State. Austin Leonard threw four touchdown passes, and added two on the ground as the Jaguars held off a second half rally by the Hornets. Willie Quinn caught the ball 12 times for 141 yards. Props to Alabama State for rotating the Devon Gales Fund banner into the top of their homepage. The good news for the Louisiana-Lafeyette Ragin’ Cajuns is that they moved to 2-3 on the season, with a 49-27 blowout win over Texas State. The bad news for the university is that they are under investigation by the NCAA for altering test scores and giving money to athletes. The school has already vacated all of their victories from the 2011 season. As horrible as all of this news is, at least they’re not the University of Southern California, who fired their coach Monday. Sammy Knight, 2011 Saints Hall of Fame inductee, will appear from 5:25 p.m. to 6:40 p.m. at the Saints Hall of Fame Museum in the Superdome. The Hall of Fame is open three hours prior, and 45 minutes after each Saints home game. Admission on game day is free, for tickeholders. Knight, a gifted ball hawk, played six seasons for the Saints from 1997 to 2002. Knight recorded 28 interceptions for the Black and Gold, returning for pick sixes. Knight reached the Pro Bowl in 2001; a year in which Knight had six interceptions, five recovered fumbles, and a sack. In addition, the Saints announced today they got tickets back from the Atlanta Falcons for the Oct. 15 game between the two clubs in the Mercedes-Benz Superdome. In a press release, they said tickets the club supplies on a weekly basis to the opponent and are returned to the club are placed up for sale to fans when unsold by the visiting team. Purchase tickets at the New Orleans Saints ticket office at 5800 Airline Drive in Metairie or call 504-731-1700, 8 a.m. to 6 p.m. today and Wednesday, and on Thursday from 8 a.m. to 4:30 p.m. in Metairie and after 4:30 p.m. at the Mercedes-Benz Superdome or click here. Saturday’s LSU game may have been the last we’ve seen of the “Head Ball Coach’s” coaching days, as it was reported late Monday by Thayer Evans of SI.com, that Steve Spurrier, South Carolina’s head coach for 11 seasons, has retired – effective immediately. No reason was given for Spurrier’s retirement. Stay tuned to @fullsportNOLA for details.